We are new to RV'ing. 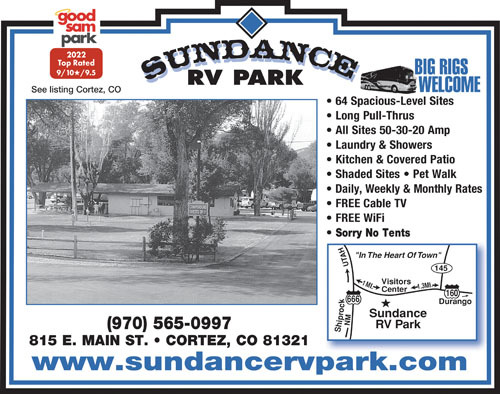 So far, this is one of the best RV Parks we have visited. The management was friendly and helpful. The grounds are visibly maintained. We saw someone on a cart driving around and checking over the sites and tending to them. The sites are level, clean, and neat. The location is great! It was a short drive to Mesa Verde and the town of Cortez offers shopping and restaurants. 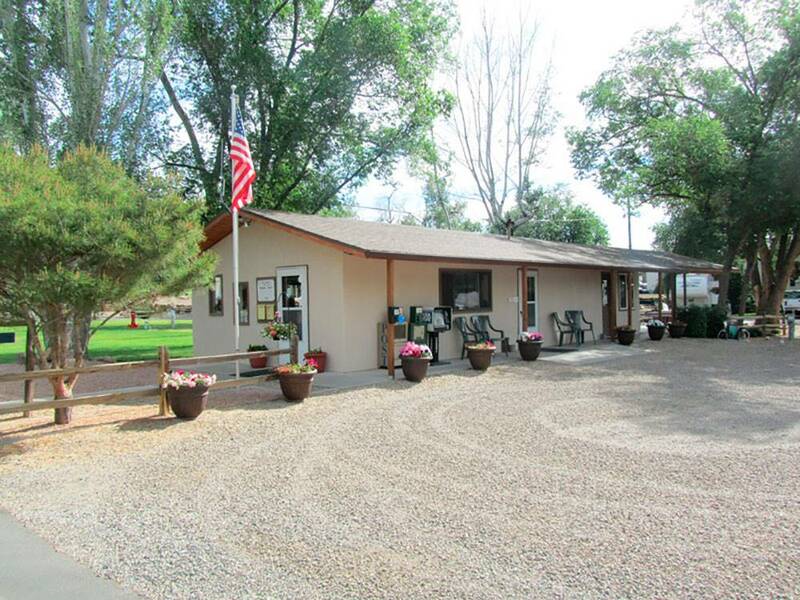 We highly recommend staying here if you need a campground in the area. We stayed 4 nights passing through the area to visit the nearby National Park Service sites. While the park is centrally located along a 5 lane busy commercial road in the center of town, the access is very difficult due to the angle getting off the street, over the sidewalk and down into the park. This arrangement posed a scrapping and collision hazard. We had made reservations in advance of our arrival. After we registered, paid for our stay and started setting up in the assigned pull thru site (#37), the staff informed us that we were going to have to move as the site was needed for a departing host. The site we were told to move to (#35) would not work for us due to the tree canopy and slope. Every excuse a woman who seemed to be acting in a manager role used to explain why we needed to move applied to the host she was trying to put in the site so there was no justification for us to move but she maintained that we had to move. She offered no compensation or incentive to mitigate this poor treatment that resulted in a significant inconvenience. This was the poorest customer service we have ever experienced in our 5 plus years of full timing. We tried to go to another park in town but they were full so we had to stay in this park. We ended up in a back in site that required extensive blocking in order to get level. The interior roads are paved and site parking pads are compacted gravel. There are a mixture of pull thru and back in sites. Some of the P/T’s were not easy to get into due the angle from the roads. Some of the P/T’s were long enough to remain connected to the toad but the others were wide enough to park 2 vehicles abreast if needed. As the park was built on sloping field, it showed the park didn’t completely understand the simple concept of the importance of a flat, level site as some of the sites had a slight 2 directional pitch potentially creating a leveling problem. They have full hook ups – water, electricity (50/30/20 AMP), & sewer. The utility connections were generally at the middle of the site. The sewer connect was slightly elevated but it wasn’t too difficult to establish a downhill flow. Distance establishes privacy between the sites but the sites were generally close. There was an outside table but no fire pits. Although there appeared to be a few long term residents, there didn’t seem to be the usual collection of material associated with the long term residents which have been seen in other parks. Significant amount of trees scattered around the park so satellite reception was dependent on site assignment. The park information showed 68 cable channels but didn’t mention any broadcast channels. Didn’t try to get any broadcast channels. The park provided WiFi was adequate. It was password protected. Our Verizon WiFi hotspot worked well. Didn’t try the NET10 phone so don’t know about the reception. The designated pet areas were not fenced. There was adequate space along the park’s road to exercise a dog. There were several bag dispensers and waste collection station around the park as well as a dumpster at the entrance. For being in a hazardous/severe weather area, there was no underground storm shelter. None of the structures in the park were identified as a severe weather shelter. We would not stay here again! This was an okay campground but certainly not 10-worthy. Sites were narrow, but each had a picnic bench and most had a tree. The dog walk was a partially fenced in pebble area way in the back, but there were doggie bag stations around the park. We didn't see a pool or any similar facilities. While I didn't use the laundry room, it was well lit and clean. This is a very small campground, with a number of what seem to be long term residents. Water pressure was very strong and upon check in you're told a regulator is necessary. If you don't have one they do sell them in their little store. Cable worked well but internet did not. The best thing about Sundance is it's location. If you're a walker, restaurants and stores are less than a mile away. We ate at some wonderful local places. There's a Walmart less than 2 miles away. It's also convenient if you plan to site see in this area. Very well run facility with a pleasant and helpful staff. Most incredible laundry, showers and rest rooms I have ever experienced; they look like they have never been used they are so clean, bright and well appointed. Conveniently located very near all services including Safeway, Walmart, etc. Would definitely return. A nice park with friendly hosts and all utilities worked well including good WiFi and cable. High water pressure so a regulator is a must. Good paved roads with gravel pads which are rather closely spaced but roomy enough to easily maneuver. Nice clean shower/restroom/laundry facilities. Very busy road in front of the park but quiet at night. I'd suggest stopping for gas at the outskirts of town at either end as the ones in town are a tight squeeze for anything large. Nice tree shaded campground with flat sites and easy in & out. Very reasonable rates. Close to downtown area and eating establishments within a short walking distance. Very helpful staff. I had a minor problem with my coach and they had available a list of mechanics and was able to get issue resolved within a day. Close to Mesa Verde and even Durango is within a short 50 mile drive. Made short with the scenery. I highly recommend this park. When we first arrived, the campsite hostess came out to greet us and get us settled in. It was so nice to take a hot shower in my own private room. Great place to stay! We spent 9 day in various campgrounds between Oregon and Colorado and back to Oregon. We were thrilled with this one and stayed two nights! We will definitely choose this one every single time we go through Cortez. The only thing that would be a bit nicer is grass in the dog park. Rocks make it easier to keep clean but often hurt their paws. Grass is what they love!!! The park and facilities were exceptionally clean and well maintained. The staff was friendly and courteous. The only thing I missed was the social activities sometimes associated with exceptional parks. Nice park for being in the center of town (Cortez). We spent only 1 night here, but had a nice large spot with grass. At least half the park is semi-permanent tenants, but the staff is friendly to the part-time guests as well. You've got several good choices if you are visiting this Navaho/Mesa Verde area--Sundance is the only one if you want to easily walk into town.